Today, 2/27/2019, we have a Scheduled Update to prepare for March. Army of the Galactic Republic: At the start of battle, Clone Troopers gain 50% Health, 50% Protection, 50% Offense, and 50% Defense for each Clone Trooper ally. Clone Troopers gain 100% Critical Chance and 100% Critical Damage while they have no debuffs. When they attack out of turn, Clone Troopers dispel all debuffs on other Clone Trooper allies, dispel all buffs on the target enemy, and gain 20% Turn Meter. Industry of War: At the start of battle, Geonosians gain 35% Max Health and 70% Max Protection for each other Geonosian ally. When a Geonosian ally uses an ability, they gain Foresight for 1 turn. Being an industrious race, the Geonosians are constantly constructing weapons of war. With Industry of War, Geonosian warriors can call on the worker drones to build these war machines (the cooldown reduction mechanic) and use them to rain destructive fire on enemies. Now I need to learn Japanese to understand the monthly calendar?? Why do you continue releasing the monthly event calenders via third party sites first? Can we please go back to publishing the calendar here first? Not only is that site ad-ridden, the link takes me to the February calendar. And yes, I can see the CDN message on the site, and I'm aware of the deals you have with the site, it just seems crazy that official information is not first shared through the official forums. I have to be reading something wrong on Heavy Artilllery. Cooldown of 3 and reduced when a Geo uses an ability? That could be as early as the 2nd character on our team to take a turn. Its will be available in English from Gaming-Fans shortly. Looks like his site is taking a moment to update. Also, we will be posting the calendar on the forums in the future. I noticed a lack of Bounty Hunter I and II on the calendar. Does heavy artillery ohko 2 toons? Or am I taking the meaning of destroy wrong? Darth revan on March 21st? I will not be using an ad-ridden garbage dump of a site for information that should be on the forum. Thanks for another reason to work on my geos! Just needed an excuse to gear them up for ships. I feel like this may be a clue for an event. Anyone else? So every two turns a geonosian squad will defeat two enemies. I’m assuming the defeated enemies can still be revived? Not quite. It doesn't stay they can't be revived. 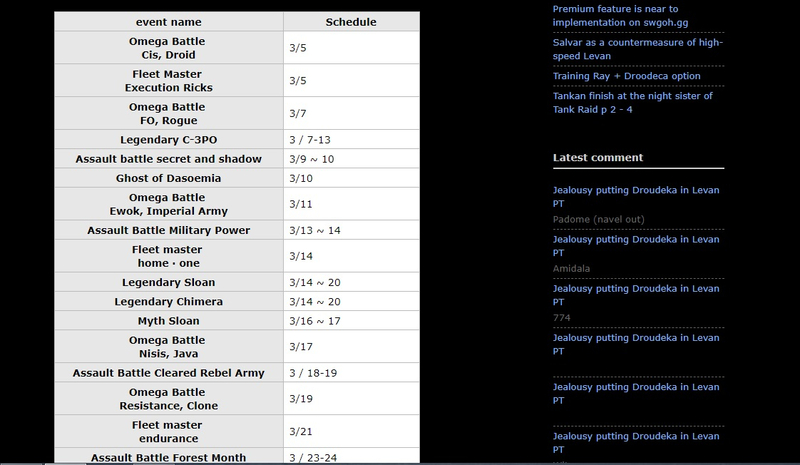 @CG_SBCrumb Are Galactic Bounties I and II suppose to be on the calendar for March? Hmm... Is there something more to this? Man do I miss when bonuses were just fun things that slightly made you better and were not op for no reason at all other then to make us waste resources on bad characters that are useless in every other aspect of the game. Giving Geo's a double annihilate. lol. With constant foresight and a buff that makes them super tanky. Gonna be great fun. And back to waiting for the Chalendar to be on an English site not ruined with advertisements. Why bother coming here if all the valuable information is available on 3rd party websites? I think many of us, if not all, prefer to get our information from the official forums. We haven't had a puzzle in a while. I miss them. I hope the next one is due soon, and has some surprises beyond the obvious "Gammorean Guard"
Thanks for the upcoming schedule. What my real concern is, why has no dev responded to the red hot thread that is the Finn nerf with stern language of no zeta refund? The Finn zeta has been around for 2 years plus, and cg is on record saying his leadership is working as intended and the problem is in the interaction with the Sith raid (we're now seeing 2 new teams or characters that have problematic interactions with p3 as well in cls and droideka). Additionally, the precedent has already been set when major changes like this happen, namely zarriss and daka (who wasn't even primarily affected). To drop a bombshell on the way out the door on a Friday that you're going to change a long standing, heavily invested character with no option of zeta refund and still not address it to date (even though that forum page has 36 pages to date of venomous outrage, largely in part to the communication and handling) is more distressing than all this disappointing grievous business to me. I hope you and your team make this right by either rethinking the Finn leadership nerf or rework, whichever you prefer, or by allowing us the opportunity to get our investment of time and resources back (namely just the zeta). Also, a little communication goes a long way as was proven here, and if you haven't noticed yet you'd need a riot shield you walk into that room at this point due to the neglect. You may have seen me post this in other threads, and I plan to continue until it is addressed. It’s a trap! Spend gear on Geos at your own risk!